Hundreds of people in Kent are assessing the damage done to homes and businesses by a 4.3 earthquake. Homes in Folkestone were evacuated and one woman suffered a neck injury when the tremor struck on Saturday morning. Events of this kind are RARE in the south east. Its epicentre was nine miles off the Dover coast but it was also felt across East Sussex, Essex and Suffolk. And 140 miles away in Hampshire, a 1,000-yard long and 6in wide crack opened up in a seaside clifftop. The Marine and Coastguard Agency evacuated beach huts at Barton-on-Sea for fear of a landslide. A spokesman said: We do not know if it is linked to the earthquake but it is too coincidental to ignore.' The first warning may have come from a dolphin nicknamed Dave, which is spotted regularly by divers and fishermen off the Kent coast. A man who was walking along the beach in Sandgate when he noticed the dolphin, said: "I saw Dave jumping in and out of the water and thought it was strange. Then there was a massive tremor. It was like Dave was trying to warn us." Police cordoned off the five worst-hit streets in Folkestone to stop passers-by being injured by dislodged bricks and tiles. There were unusual scenes as panicked residents filled the streets, many in their nightclothes. In nearby Lympne, 'wheelie bins were rolling down the hill one after another. It was surreal.' "It is a miracle that only one serious injury was sustained." The Dover Straits has tremors about every 200 years. One was recorded in 1382 and a quake in 1580 killed two people in London. There were smaller tremors in 1776 and 1950. 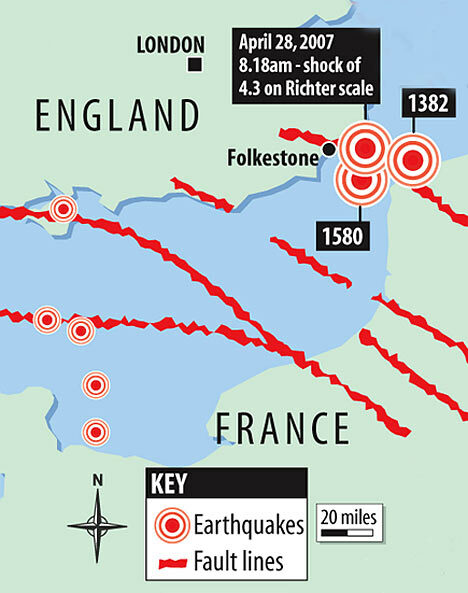 The Kent incident is the largest recorded in Britain since a 5.0 earthquake in Dudley in 2002.